Why am I doing what I am doing? Can I think differently? Can I do better? Micropsychology can provide new answers to such questions. Micropsychology treats all mental activities as information handling processes. It focuses on the basic information handling processes that the brain uses, and shows how they combine to form macro-behaviors, which are the realm of psychology. By becoming familiar with those basic processes, we can better understand why we do what we do, find alternatives, and evaluate their feasibility. 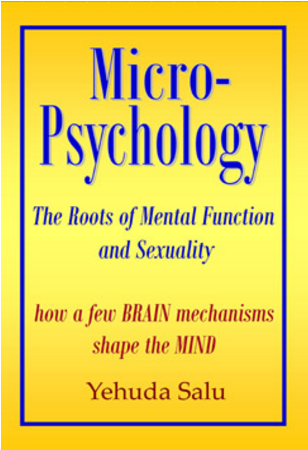 Micropsychology relies on findings from biology, information science and psychology. The book "MicroPsychology by Yehuda Salu" is written in the form of a workshop in a university setting. The main themes are presented by the moderator, and their scientific foundations and implications are clarified by discussions with the students. Using this lively, down-to-earth, yet scientifically sound presentation, the book combines recent discoveries from biology, psychology and information science to explain the basic mechanisms and how they build-up high-level mental activities such as: learning in general, learning sexual attraction and arousal, thinking paradigms, perceiving, decision making, creativity, behavior modification, and more. One of the high-level mental activities that the book analyzes at length is human sexuality. The book shows how innate information-handling-mechanisms determine a person's sexual orientation, and how personal experiences mold the triggers of sexual arousal, which shape a person's sexual behavior. · How does the brain represent information? · How neurons express various associations between information entities? · How basic biological mechanisms organize the information-structures of the brain? · Which neural mechanisms underlie sexual arousal and mate selection in animals? · Do pheromones affect human sexual drives? · Which neural mechanisms underlie the development of sexual arousal and sexual orientation in humans? · How does the brain retrieve stored information? · What does the brain do if it cannot retrieve information according to a specific retrieval request? · What brain mechanisms underlie creative thinking? · How basic brain mechanisms affect intelligence? · Why some of us are good in history and some in math? · Are there limits to our perception of the world? · What is free will? · What are the underlying biological mechanisms of behaviors that could be modified and of behaviors that are fixed? The book is a useful resource for people interested in the intriguing area of Brain-Mind relationships, for those who wish to better understand why-they-do what-they-do, and for neuroscientists, information scientists and psychologists in search of meaningful research topics.